Change of Use / Conversion of a damp and disused A1 shop unit into a comfortable two-storey garden flat located in Hackney, London. Complete internal remodelling has resulted in a well-planned, flexible layout including an open-plan kitchen / living space, and in compliance with current guidance for new homes in London, ie Lifetime Homes and the London Plan. Fittings and finishes include aluminium-framed windows and doors, galvanised steel balcony and stairs to the rear garden, a composite stone kitchen worktop and oak flooring. 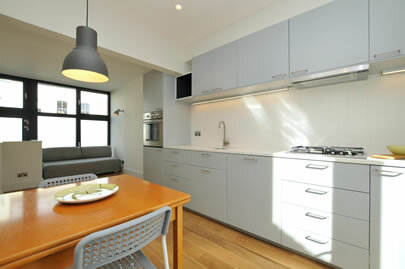 Natural and artificial light to the flat has been carefully considered throughout.